My little group of Eve stories are Fan Fiction for Eve Online. My goal is to capture the feel of playing Eve and slip that into a textured world. 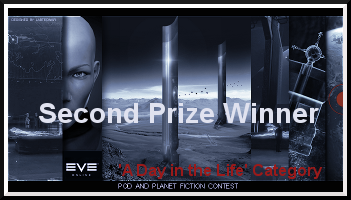 Written for the 2012 Pod and Pilot Fiction Contest. "Ill Gained Goods" - A tail of piracy in the space lanes. (October 29th, 2012) Second Place winner. This story is around 10,000 words. I've broken it up into three parts for readability. I am fortunate to get a lot of help from people. My early stuff has little editing. My later stuff I've amassed a stable of people with a clue to comb over things. I appreciate their work. Also my gankers and pirates and technical mechanics wizards who discuss various elements of reality within my idea.